The date for Keynsham Farmers’ Market’s move to the new Market Walk development has been delayed until the new year, it has been revealed. Stallholders were originally due to relocate to the new site this month but they will now remain at Ashton Way car park for their November and December markets. The first market at the new town centre site is expected to be on January 10. 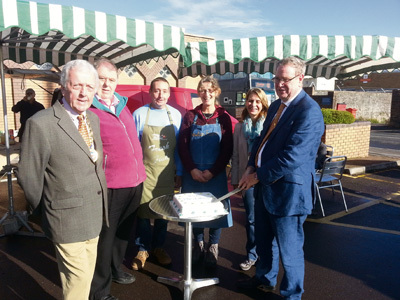 There were celebrations at the market on October 11 when the event marked its 10th birthday with entertainment from Bath Vintage Brass Band, a tombola with prizes and a birthday cake from Keynsham Country Markets. On hand to cut the cake were B&NES vice-chairman Councillor Ian Gilchrist, town council chairman Councillor Clive Fricker, town councillor Tony Crouch, prospective parliamentary candidate Wera Hobhouse and long-standing stallholders Steve Harvey and Lesley Bowers. The next dates for the farmers’ markets are November 8 and December 13, both at Ashton Way, and January 10, at Market Walk. Customers will be able to pre-order some Christmas items at this month's market as well as buy gifts.